Sealaska Heritage Institute (SHI) will sponsor a homecoming ceremony for a sacred Chilkat robe this week that was donated to the institute by a Seattle couple at the urging of their teenage daughter. The ceremony is scheduled at 1:30 pm, Saturday, Aug. 26, at SHI’s Walter Soboleff Building in Juneau. This is a public ceremony, and everyone is welcome. Video of the ceremony will be streamed on Facebook Live and later posted online. 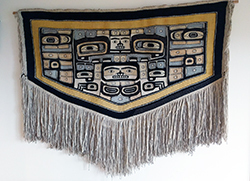 Bruce and Gretchen Jacobsen purchased the robe in 1995 and donated it to Sealaska Heritage in August at the prodding of their daughter, Sara, who saw a similar robe in an art book and realized the significance of Chilkat robes to Northwest Coast tribes. “She thought it was an important cultural item for the people who made it so it belonged with them, not us (of European heritage mostly),” wrote Bruce Jacobsen, who initially asked for anonymity for his family but later authorized the use of their names. “In general, Sara also believes that the American culture ‘appropriates’ cultural items from other cultures without giving them credit, and this diminishes their ability to continue to benefit from their heritage. Finally, she stated that she doubted that the original owners/creators of the piece were paid a fair price for it,” he said. After a week of “relentless” pressure from Sara, the Jacobsens consulted with the Burke Museum in Seattle and Sealaska Heritage and ultimately gave the robe to SHI so weavers could study it and because the institute has a robust program to revitalize ancient art practices, Bruce Jacobsen said. SHI President Rosita Worl said she was stunned and elated about the donation, especially given the monetary value the robe could have brought to the family. The robe, which was likely made in the late 1800s or early 1900s, is considered to be clan at.óowu, a term that describes sacred clan treasures, regalia and other ceremonial objects and includes ancient songs, stories, dances and intellectual property. Tlingit, Haida and Tsimshian people believe their at.óowu has spiritual dimensions and that the donated Chilkat robe is imbued with the spirits of the ancestors who were associated with it, said SHI President Rosita Worl. “We know that the crest itself is a spirit and that someone paid for it with his or her life,” Worl said. The design on the robe is unclear, but it is thought to depict a bird—possibly a raven, thunderbird or osprey. Since the tribal and clan affiliation are unclear, the homecoming ceremony will include both Eagle and Raven clans addressing the spirits of the robe along with Tlingit, Haida and Tsimshian representatives, Worl said. Master Haida weaver Delores Churchill and Ravenstail weaver Kay Field Parker were given an opportunity to study the Chilkat robe after its arrival in Juneau. The two weavers spent more time looking at the back of the robe than the front, because it is on the back that the original weaver’s decisions and techniques can be seen more clearly. Among their observations, Churchill and Parker noted the presence of expertly formed circles, of variations in color and texture indicating changes in yarn during the weaving process, and the presence of both mountain goat wool and commercial yarn. The use of red cedar in the warp and the sparse presence of mountain goat “guard hairs” in the fringe was also noted. Churchill also noted the genius of the weavers, who were able to weave a circle from a square, noting no other weavers in the world were able to achieve that. Churchill and Parker speculated that the lower right portion of the robe may have been completed by an apprentice, as the variations in color and texture were most apparent in that area. The weavers also emphasized the generosity of the donors’ gift, and the many opportunities it will provide for future study.